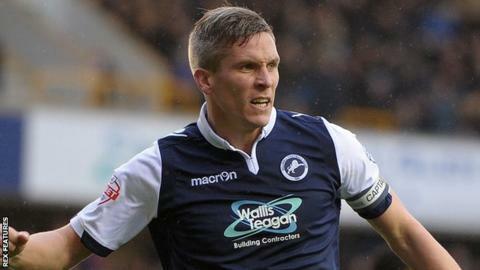 Two goals from Steve Morison helped Millwall to a comfortable victory over Peterborough United in League One. Lee Gregory should have scored for the Lions when he volleyed over from close range, but then provided the cross for Morison to head them in front. Shane Ferguson crossed for Gregory to double the lead with his head, and then set up Morison to nod in his second. Morison sent another header narrowly wide late on, as Peterborough lost for the fourth time in five league games. The win moved Millwall up a place to fifth in the table, with Posh sliding further out of play-off contention in 12th, eight points away from the top six. "I thought our all-round attacking play was excellent today. "We did really well to get the ball into wide areas. I thought the front two, with and without the ball, were excellent. "Their quality with the ball is there to be seen because their goal tally says so - 20 goals (for Lee Gregory), 12 for Steve Morison, they're a good pair. "There's a spirit about us and we dig in for each other." "They played pretty much as we thought they would, there were no surprises for us, we prepared for everything that came our way. "We didn't execute the job that we came here to do. I don't think in possession we took anywhere near enough responsibility for the ball. "I don't think we developed our forward game in any serious way. "We didn't box clever, things we knew they did undid us, which is naive, and I think we're capable of better than that." Match ends, Millwall 3, Peterborough United 0. Second Half ends, Millwall 3, Peterborough United 0. Mahlon Romeo (Millwall) is shown the yellow card for a bad foul. Michael Bostwick (Peterborough United) is shown the yellow card for a bad foul. John Marquis (Millwall) wins a free kick in the defensive half. Martin Samuelsen (Peterborough United) wins a free kick in the attacking half. Corner, Millwall. Conceded by Ricardo Santos. Substitution, Millwall. Fred Onyedinma replaces Shane Ferguson. Foul by Souleymane Coulibaly (Peterborough United). Shaquile Coulthirst (Peterborough United) wins a free kick in the defensive half. Foul by Nadjim Abdou (Millwall). Jon Taylor (Peterborough United) wins a free kick in the attacking half. Attempt saved. Souleymane Coulibaly (Peterborough United) right footed shot from outside the box is saved in the centre of the goal. Substitution, Millwall. Aiden O'Brien replaces Lee Gregory. Shaquile Coulthirst (Peterborough United) wins a free kick in the attacking half. Substitution, Millwall. John Marquis replaces Steve Morison. Martin Samuelsen (Peterborough United) wins a free kick in the defensive half. Attempt missed. Shaquile Coulthirst (Peterborough United) left footed shot from outside the box is high and wide to the left. Corner, Peterborough United. Conceded by Jordan Archer. Attempt saved. Marcus Maddison (Peterborough United) right footed shot from outside the box is saved in the centre of the goal. Lee Gregory (Millwall) is shown the yellow card for a bad foul.